This summer it has been my goal to get all three of my boys reading books regularly so when The MotherHood approached me to be involved in VTech Voices for the new VTech Animated VReader, I excitedly responded…of course. The Animated VReader is aimed for the 4-7 age crowd and has stories and games to bolster reading ability. My Rhett is 4 1/2 and a pre-reader. He loves to be read to and is obsessed with letters and sounds. He is an eager participant so I figured this would be something fun we could try out together. We were sent a VReader which comes with a “book” cartridge that also has one letter arcade-type game and several quiz-type games that relate to the story. Rhett can push a button to hear the story (he just has to “turn” the pages with an arrow button) or for more advanced readers, the story can be read by the child and difficult words can be pressed for assistance. There is also a dictionary function that gives the definition of a story word. For our first VTech Voices assignment, we were to highlight a place that we usually read and explore new places to read. The most common place in my house that we read is our living room couch. It is big enough that all the boys can gather around…and everyone can see the pictures. There is enough light and it has easy access to baskets and baskets full of books. I caught Rhett quietly listening to the VReader’s What’s That Noise? book and I moved a few toys off the couch and clicked the picture to post. Since the couch isn’t a super exciting place to read, I wanted to really push the limits of my imagination to come up with another place…exciting and new. You know, pose him with the VReader in a creative reading environment and snap a picture to blog. Everywhere seemed to have some issue. Rhett didn’t need me to push him into a creative place to read. Where have you caught your children reading? 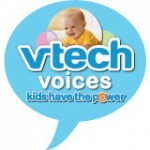 I was asked to write this post as a part of the VTech Voices blogging series. I received the VReader and a stipend for my participation. 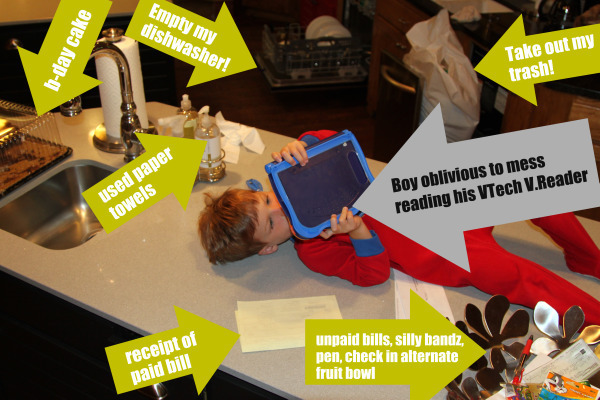 As obvious by the picture above, my son’s opinion about the VReader was not coerced in any way. Had the photo been posed, I would have certainly cleaned up the kitchen. Check back tomorrow…I will be hosting a 24 hour giveaway for the VTech VReader! I miss reading to the kids. Every once in a while I try to get us all together and read something, but it never lasts more than a couple of days. I used to read to them every night in one of their beds. It was great cuddling time. When they were very young I converted their tiny closet into a bookshelf/reading area complete with a tiny little camping chair. 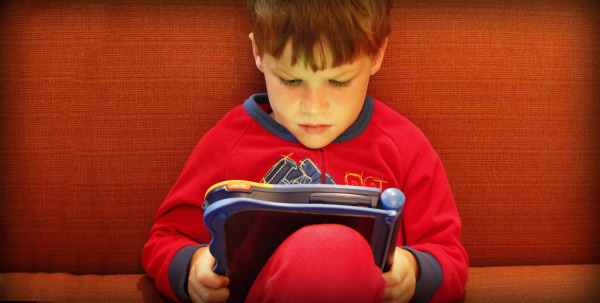 OH NO… he’s on the fast track to wanting a Kindle from Santa. We saw this in an ad before Toy Story 3 and were very interested. My almost five year old is a bigtime reader and a “kindle for kids” would be a perfect present for his upcoming birthday. My question is: Can you turn off the “read to me” function? Also, can you download books into it or do you have to buy cartridges/games for it? I loved reading to my kids – I even read Madeline L’Engel and Roald Dahl (and some others but those are the ones I remember best) to them when they were TEENAGERS can you believe? They tell me they loved hearing my “voices” as I read the characters. They still like audiobooks when they are driving. And is it any wonder that two out of the three are have careers in theatre and the arts? Now my grandchildren would probably love that VTech reader. The 3-year-old has gotten hold of some of her mother’s “turn-the-page” books (yes, I managed to keep some of them for nearly 30 years!) and loves ABC’s and words and manages to follow most of the words. Thanks for the Christmas idea! But please answer the above questions. Might make a difference in the purchase. Yes. You can turn off the auto-reader so the child reads to herself. If they come across a word they do not know, they can push it and it will say the word out loud in that function. There will be a download center on the VTech site. I have sent a question to them as to when it will be live. Right now it is still “coming soon”. I am anxious for that as well! And YES. I can’t keep them out of the footie pjs even in the summer…of course, there are so many holes in them that they have “air-conditioning”. I love that last picture! SO cute! My kids and the cousins who have been visiting are mesmerized by the V.Reader. I keep catching an unexpected child curled up with it. It’s awesome for the car too!